Built in 1969, Metsamor, Armenia (then the Armenian Soviet Socialist Republic), was intended as a settlement for employees of a nearby nuclear power plant to be completed between 1976 and 1980. But the power plant would never realize the ambitions of its creators. In 1988, an earthquake caused the facility to be shut down. In 1989, the collapse of the Soviet Union prompted a complete construction freeze. The symbol of the dream of a technologically advanced nation, Metsamor remained incomplete and fell into decay undiminished by the recommissioning of the power plant in 1995. 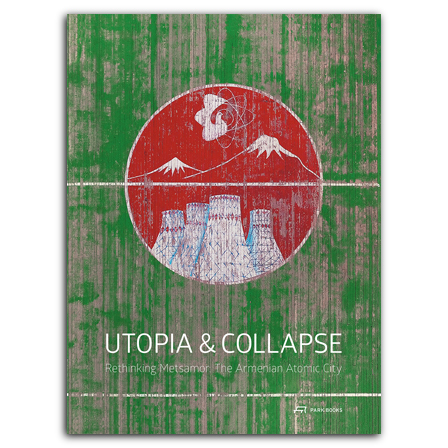 Utopia and Collapse documents the rise and fall of Metsamor. The book brings together an oral history of the place and a photographic research by Katharina Roters with essays by Jorg H. Gleiter, Ievgeniia Gubkina, Misak Khostikyan, Hamlet Melkumyan, Sarhat Petrosyan, Katharina Roters, and Jozsef Szolnoki. Among the topics discussed are Armenia’s cultural and and architectural histories; the typology of Soviet atomograds, or atomic cities; and the phenomenon of modern ruins. Although today the power plant’s workers live in a partly built failed utopia, Metsamor stands as examples of the highly idiosyncratic Armenian variety of Soviet Modernism of the 1960s and ’70s, making this a fascinating story for anyone with an interest in Soviet-era buildings and architecture. Shortlist of the German Photobookaward 2018.
ist Gründer und Direktor von urbanlab – einem unabhängigen, in Yerewan ansässigen städtischen «urban think tank». Er ist Autor zahlreicher Publikationen und Zeitschriftenartikeln und war Kurator des armenischen Pavillons auf der 15. Architekturbiennale in Venedig 2016.
ist bildende Künstlerin und lebt in Budapest. Ihr erstes Fotoprojekt «Yerevan Concrete» fand 1999 in Eriwan statt. 2014 realisierte sie ihr Projekt Hungarian Cubes, dessen Buchpublikation mit dem DAM-Architektur-buchpreis ausgezeichnet wurde.